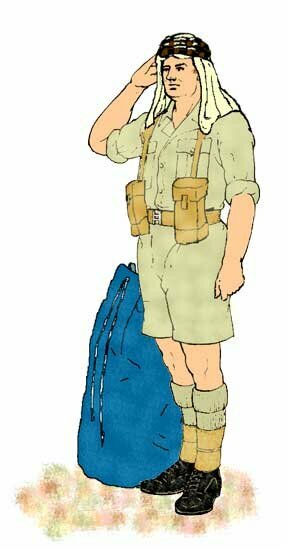 Individual Equipment & Special Issue Uniforms of the LRDG. Typical patrol wear. 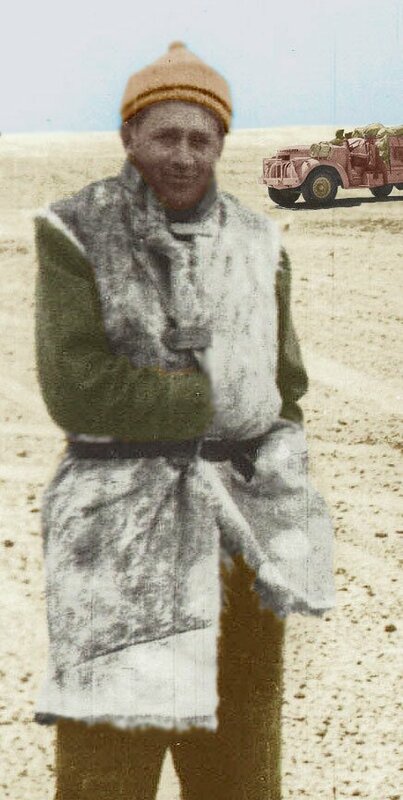 Color enhancement of unidentified LRDG Lieutenant wearing Battle Dress, sweater, and knit cap. 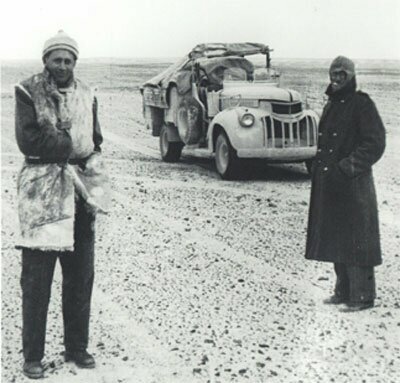 The LRDG was drawn from throughout the British and Commonwealth forces with every man arriving at the unit with their own personal equipment. As such, their was a variety of uniforms and personal equipment found within the unit. The tab, like the Scorpion crest, was not worn on patrol. Tropal coat, a heavy kapok lined overcoat. The Hebron Coat, a shaggy goat skinned coat, locally acquired. 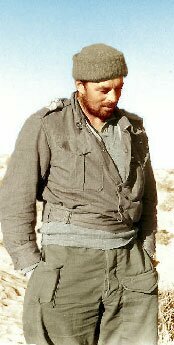 It should be noted that Bagnold obtained the Arab head-dress and hebron coat from the stores of the Trans Jordan Frontier Force. *Rommel goggles is a modern term for standard British Army issue gas goggles. These goggles were made famous by photos of Field Marshall Erwin Rommel wearing them on his cap. Close up view of the issued desert sandals. William Kennedy Shaw takes time out of his busy work schedule to model the Hebron coat. These locally procured goat skin coats were especially warm and aided in passing as locals.The shaggy coats were natural colors and varied from white to black. They were very effective in cutting the desert chill. The photo to the right has been manipulated, the original photo being B&W. The color of the coat is based on color photos of actual hebron coats and color plates found in books about British Army uniforms in WWII. The original photo appears below for comparison. Color enhanced photo of William B. Kennedy Shaw is used to give an idea of the color of the hebron coat. 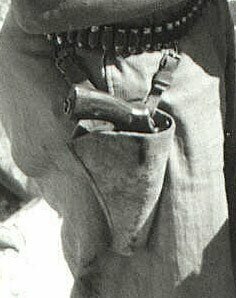 The basic uniform worn in the desert was the Khaki Drill (KD). The color of the uniforms varied due to different manufacture and also normal wear. The KD was basically "khaki" or tan. The standard uniform of the British Army and Commonwealth was known as Battle Dress (BD). It tended to be shades of olive brown. The 1937 pattern web gear varied from mustard to olive. The issued boots were called "ammunition" boots and were normally black. 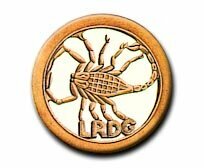 Besides these items, the LRDG trooper was issued items discussed above. In the sketch to the right a new volunteer shows up in Siwa, ready for duty. He wears the Arab headdress, KD shorts and shirt. The 1937 pattern webbing including two Universal (Bren) pouches. On his feet he wears the issued wool socks, gaiters, and ammunition boots. By his side, his personal belongings are stored in a sea bag. 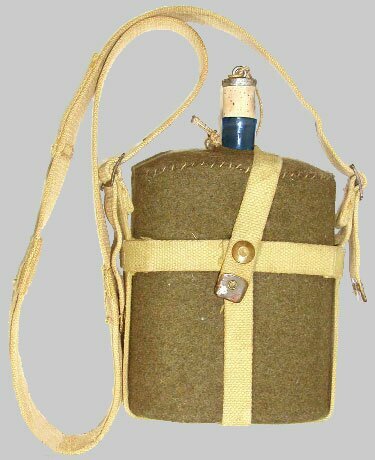 The Standard British Canteen held one quart of water. A larger two quart canteen was also used. The canteen was a vintage design changing little from the World War I canteen. It consisted of a enamel lined metal flask wrapped in cloth. The neck of the flask was some times painted blue to let you know it was for water. The flask was closed with a cork stopper. The canteen did not come with a cap as did the German and American canteens, which explains why so many soldiers carried an enamel coated metal cup. The cloth covering could be soaked in water to help keep the flask cool, but in the desert this was a waste of water and impractical because the water would evaporate so quickly. Typically the canteens were buried under the sand when on road watch which provided a better cooling solution. 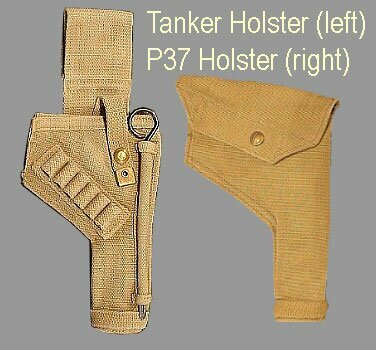 The two main holsters associated with the British Army during WWII is the P37 pattern and the Tankers holster. The Tanker's holster was flapless with the pistol being secured by a simple snap strap. Initially it was worn low on the hip via a long webbing strap. This proved impractical and was replaced by a shorter strap. The holster provided for six rounds and a cleaning rod on the out side. British pistols were often secured with a lanyard around the neck. this often proved impractical with the lower slung tanker holster. According to most sources the P37 holster would accept any revolver and the Browning HP35. One source, however claims a special holster was issued with the S&W. A larger holster, similar in design to the P37 was issued for the .455 Webley/Enfield pistols. The Pattern 08 continued to be issued to African Colonial forces long after the rest of the Commonwealth began using the Pattern 37 Webbing. It was not uncommon to see bits and pieces of it used by British forces during World War II especially in the early years of the war. 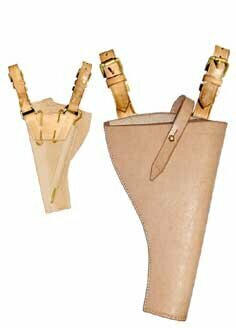 The holster uses the Wilkinson Cavalry Holster Adapter which was very popular with British officers who preferred to hang their pistols from a Sam Browne Belt rather than use the regular Pattern 08 webbing. The adapter allows it to hang from a belt using hooks or from "O" rings on the Sam Browne Belt. The restraining strap and brass clasp have been removed. The pistol in this case, appears to be a Smith & Wesson M1917 revolver which fired the .45 ACP round. Note also, the extra cartridges in the belt from which the holster is suspended. The use of such a belt, left the bullets exposed and led to a very slow reloading of the pistol. Of course if you needed to reload the revolver quickly you were probably in much more trouble than it could get you out of anyway.